Good Harvest columnist Brian Ng is concerned with the number of the growing number of huge bungalows kept in a sorry state-of-affair in exclusive housing areas on Penang island. I have recently noticed that there are many unkempt bungalows left unattended or to rot by their owners on the island. They are mostly around areas in Tanjung Bunga, Jesselton Heights and Minden Heights in Gelugor. Mind you, these are no ordinary bungalows but with values of over RM5 millions each – with huge “For Sale” banner and signboard hung outside it. Drive around these places, and you will surely understand what I meant. I had curiously asked around about these properties and was told that they were left unattended for a long, long time. It is not uncommon for each these properties to have five to six rooms and the equal number of bathrooms. However, over the years, these bungalows had since “grown” too big for their now ageing owners. with two or three young children living with them at that time when they moved into their “new” home. By now, the children should be in their late 40s, with some, happily married, and moved elsewhere to work. Some of them even migrated to work permanently at the country where their parents first sent them to further their studies, and now. with no intention of coming back to Malaysia at all. So, who is left staying at the bungalow? Yes, their two elderly parents, who should be well over the age of 70s or 80s. No worries, if they had cleverly planned their remaining days well by shifting to a smaller dwelling place much earlier to continue with their life. Now, the main point I am trying to ask here is whether the bungalow is being maintained well or not after the two elderly had moved out? Well and good, if it is maintained by hired workers regularly. Now, what happens if both the elderly is not in good health to even check on the condition of the property themselves some time on? The building will surely ruin fast. difficult for the owner or their children to sell it off now. Talking about it, I have a couple wanting to sell off their 9,000 sq ft bungalow in Pearl Hill off Tanjung Bunga for RM5 million. I had an instant headache when I viewed the building a few days ago. It was such a run-down bungalow and unoccupied for at least two years. be way below the market value for that size of the building? Likewise, no buyer will pay for that amount for such a worn-out building. Unless, the buyer likes the location and has intention to tear it down to rebuild a new one over it! Still, if only the bungalow was well kept, the RM5 million price tag is certainly be a good buy for a property in the prestigious Pearl Hill enclave! All this checking is to ensure that no details is overlooked which may cause the complications on the sale process. buyer, get the right banker & lawyer as well. Real estate negotiators / agents will have the first hand market information that can be disclose to the buyers / sellers. point you in the direction where you can find more data on schools, crime or demographics in that area. All this information are very useful to determine whether you are buying the right property or not. that were overlooked in the excitement of closing. Good negotiators / agents stand by and ready to assist. Worthy and honest negotiators / agents don't leave you in the dust to fend for yourself. Ten applications, seven rejections. Unbelievably, but that’s how Penang Housing Committee chairman Jagdeep Singh Deo described as to how the current loan rejection rate of 60% or even 70% was a cause for concern for the state government. “Imagine for every 10 people applying for bank loans only three applicants obtained approval. “This completely nullifies our efforts to provide adequate housing for Penangites. “It makes all our efforts in vain. “This has been a very long outstanding problem … we need to sit down and address the issue with Bank Negara soonest possible,” Jagdeep said at a Press briefing in Komtar recently. Jagdeep knows what he was talking about. He has been tackling this problem over the years ever since he helmed the housing portfolio. If he has his way, Jagdeep would like to see all first-time house buyers have a roof over their head and that the state government. Allow me to be a bit personal here. That go-all-out effort signature-trait in helping people always runs deep in Jagdeep’s family. I have been a close family friend of the late Mr Karpal Singh for almost 35 years and have seen it all through how they went all out to help the ordinary folks. Being a family of great lawyers in the country, they, including Mr Karpal, had always taken on legal cases pro bono for the deserving ones. Even though he no longer practices law now, Jagdeep, is still continuing the family trait by giving his best in helping deserving Penangites to have a house of their own. He has never stopped short in perpetually urging Bank Negara Malaysia to review its criteria for house loans for first-time home owners. And he has got strong support. Five parties, three chambers of commerce and two development associations have joined forces with him on this. The five are Real Estate and Housing Developers Association (Rehda) Penang, International Real Estate Federation (FIABCI) Malaysia, Penang Malay Chamber of Commerce, Penang Chinese Chamber of Commerce and Penang Indian Chamber of Commerce. In a signed statement addressed to the Housing and Local Government Ministry, the five expressed their concern about the rate of housing loan rejection, particularly for low-cost, low medium-cost and affordable housing. Jagdeep added that this issue was raised by former Chief Minister Lim Guan Eng and himself during the state assembly even way back in 2016. “After reaching a unanimous agreement, a joint motion was forwarded to former Prime Minister Datuk Seri Najib Tun Razak and Bank Negara Malaysia. “However, there was no follow-up,” he said. An official letter would be send to the Housing and Local Government Minister Zuraida Kamaruddin to follow up on his previous meeting with her where they had discussed the matter. Believe it or not, the banks in our country had time and again denied that it was difficult to get housing loans approved. Among the reasons they cited for the housing loan rejection include insufficient income to support debt repayment, adverse credit history, and inadequate income or financial documentation. Is it that difficult to get a housing loan from the bank now? Next: Why I dislike dealing with the banks. Joshua shares with Good Harvest Media on how to Be Exclusive and Be Inclusive. We desire our vendors and landlords to appoint us exclusively to market their property. We control our sales activities well without fearing our competitors to undercut our deal. Viewing appointment can be scheduled and we do not need to rush fearing the viewer may call others if we do not show up fast. We are reluctant to do co agency if we do not obtain exclusive appointment. We react to the above situations because of fear. We fear that we may lose the deal. We want to win, we want control and we want certainty. We hoard for listings that we have no intention to work on or just render minimum effort. No wonder a lot of negotiators are telling me that vendors do not give exclusive appointment anymore. Vendor, buyer, listing agency and co agency must win. Vendor sells and buyer buys the property at fair price. Listing agency invites all the other negotiators who are active in the area to market the property. We can work fast, giving the property the maximum exposure and avoid price under cutting. This will only happen when we are willing to be INCLUSIVE. Listing agency will do the listing presentation and render professional advice to the vendor. Ask for the exclusive appointment and then invite our friendly agency to work together. "A slice of many big cakes is larger than a whole small cake"
"Doing the right thing right"
Penang IQI Realty Head Of Team Aster Ng shares with Good Harvest on why an agent or negotiator should not take on more than one appointment at a certain time. I really like this American Proverb: "Don't bite off more than you can chew." Ha, imagine me putting a very large piece of cake in my mouth so much so that I can't chew it all. By right, I should be taking small bites and slowly eat the cake, which is true in many aspects of our lives. There again, this phrase is often used to discourage people from accepting or agreeing to more responsibility than they were able to manage. In fact, this just happened to one of my many female team members last week. I don't know how it came about but she suddenly ended up having more house-viewing appointments than she could handle personally. Having caught in a seemingly frustrating Catch-22 situation, she desperately sought help from our fellow team members. I normally don't but this time, I was forced to step in to advise her to arrange all her appointments properly so as not rush "here and there". This sweet young agent of mine subsequently explained that all those appointments came in at the very last minute. Granted, such nature of appointments are often and greatly beyond all real estate agents’ control. Still, one should have tried to turn down these appointments in a polite way so as not to offend their clients wanting to view the properties at the time picked by them only to assign someone else to stand in for the job. Indeed, one of a real estate agent or negotiator’s roles are to show their clients around the properties that they are interested. Tell me, how would the buyer feel if having called the agent to arrange for the viewing only to find out that the latter had sent someone instead? Now, this one important question I want to ask is by not turning up for the appointment, how could she ever get a feel for how interested the viewer might be, especially having gone through to great lengths to convince the buyer to spare their time to view the said property? Unless, they are good friends and relative or they wanted the property so much ... the buyer would have just given up on the agent instantly and engage someone else who is more concerned of their needs and preference in buying a property! In this case, the call for reliability comes in when handling our clients, let alone the much-talked about "after sales services" which is quite an important value for a real estate agent too. On the other hand, if the agent were to be present at the viewing, she would have a good sense of the level of interest and how much more there needs to follow up and close the deal. 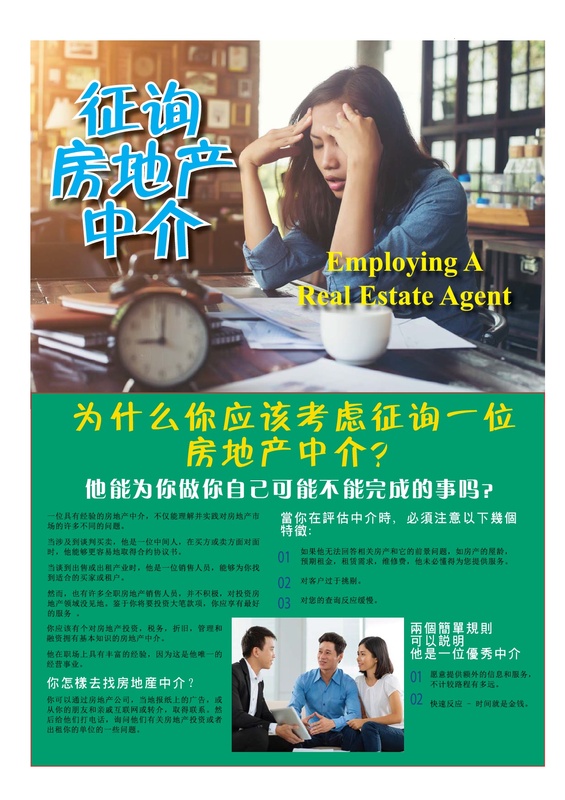 Yet again, it somehow still depends on the real estate agent's experience and negotiation skills in this field. If you are looking for a platform to learn how to create sustainable wealth through multiple streams of income that include business and investment, register yourself for the Financial Education Convention 2018 happening on 30th June 2018. Why Real Estate Agents Should Often Use Online Promotion To Get Higher Prices. You are not misreading this: Real estate agents and negotiators should always attempt to sell their listed homes at the highest prices possible! This is both for the benefit of their clients and to improve their own commissions. These are big moments for them.So how do they do that? Of course, the best way to get a high price is to go online as it allows them to broadcast their listing to a larger group of prospective buyers, regardless of whether there’s a market downturn or it is the buyers’ market now. For the larger the group of buyers they can reach, the better their chances of getting a solid offer are. It is common knowledge now that the social media marketing is the way to help one to reach more people in less time than more traditional methods. I often tell my team members to adopt this simple approach by selling a house online because they will likely see more traffic, more leads and more sales coming in. Other real estate agents and negotiators reading this article of mine should also not hesitate to go online. Just remember that a good posting often attracts thousands of views and LIKEs as well as SHARES in the Facebook the moment they are uploaded onto the web! Be perfectly prepared for it. 8 reasons why you can’t sell / purchase your property successfully without the existence of a property negotiator /agent. 8 Reasons why you can’t sell / purchase your property successfully without the existence of a property negotiator / agent. transparent way with both sides’ interests to be taken care of. appointed negotiators / agents with less worries for unscrupulous agents. clients need and at the same time to ensure the safety of the seller at home as well. negotiation involved a lot of emotional aspect in order to close successfully. VERY often those who put up their house for sale wants to dispose off their property as fast as possible. Good Harvest founder Lee Jingfa recently had a one-on-one chat with Michelle Chao, Gplex Realty Penang Senior Manager on How To Sell Your Home Fast. This is what we learnt from Michelle. 1) Can you offer us some tip for a speedy home sale, especially in a market-slowdown? "It is not easy to find a buyer especially for a residential property in the secondary market. It usually takes 3 months or even more. Some, especially those who are facing financial difficulties, will let go of their property any amount that is close to what they have requested for and this results in their property not being sold for a long, long time. Again, it also depends on the location and the condition of the house, some of which are poorly maintained. "Owner should not simply set a price for their house but should consult banks to get a valuation on their property. This is free of charge. They can even ask their appointed agents to do it for them." "It is common sense for the seller to make their house as presentable as possible. I need not have to say much about the chances of getting a poorly maintained house full of clutter to be sold in a very short period. "Never mind about the location and the process of negotiating for the right price, a clean and nice-looking house will surely make things easy for the real estate agent to sell it for you..
"Opening the doors to such a presentable house is already half the battle won in selling off the property!" I always believe it is important to do the right thing and doing things right. Every athletic recognises the strength of the core. You may have developed a pair of strong legs and a symmetrical upper body. If your core is weak or under developed you cannot execute the movement effectively and efficiently required in your sports performance. It is also the same in doing the right thing. It begins with our right core value and then doing it right. In other word it is more important to know WHY are you doing it rather than WHAT are you doing. The WHY will encourages you to wake up tomorrow morning with a sense of purpose and will propel you to complete the things to do list for the day. Ask yourself. WHY are you doing it? MELBOURNE: UEM Sunrise (Australia) Sdn Bhd, through its two subsidiaries, UEM Sunrise (Aurora Melbourne Central Property Management) Pty Ltd and UEM Sunrise (Conservatory Melbourne Property Management) Pty Ltd, has recently appointed Focused Facilities Management Pty Ltd (“FFM”) via its subsidiary, ACM Property Management Pty Ltd (“ACM”) to provide property management services for UEM Sunrise's flagship projects - Aurora Melbourne Central and Conservatory in Melbourne, Australia. 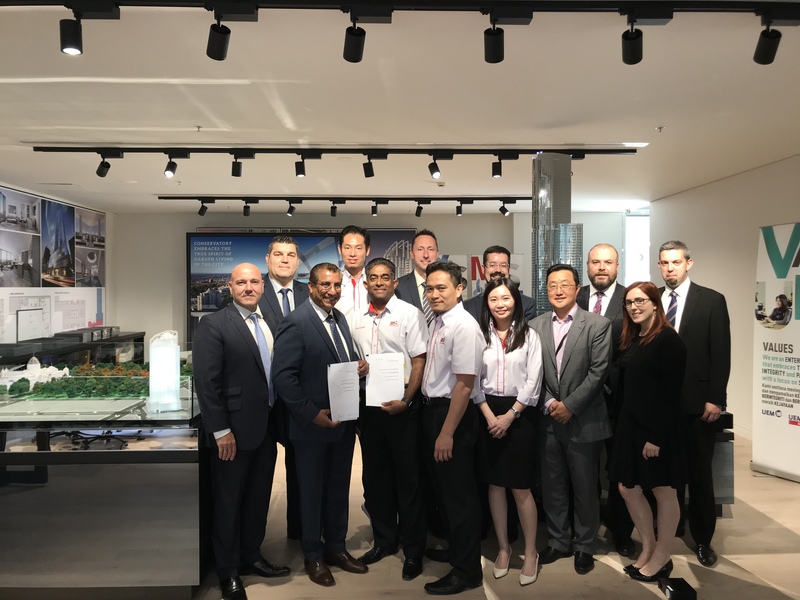 Held at UEM Sunrise Australia Corporate Office on Queen Street in Melbourne, the signing ceremony was carried out by UEM Sunrise’s Chief Operating Officer, Commercial, Raymond Cheah while FFM was represented by its Managing Director, Jeromias D’Costa. “Aurora Melbourne Central is a unique expression of Melbourne’s future – the most significant and tallest integrated mega tower in Melbourne, combining stunning residential apartments and lavish residents-only amenities with a destination serviced apartment, strata office suites and unique retail offerings, while Conservatory celebrates the perfect balance of city vibrancy and garden tranquillity – where the feeling is social, cultural and connected – the very best of urban living,” Raymond said, adding that “as a premier lifestyle developer, UEM Sunrise understands the importance of providing high quality property management services to ensure that our assets are maintained at the highest levels, with the aim of maximising return on investment. 6 Simple Steps To Get More Contacts. Look, nothing here is complicated, clever or difficult. You just have to do it consistently and I will guarantee you will be successful. this is my sales message for you. You can do so step-by-step for yourself without having to pay for or anyone else. You will only get enquiries from people that know you exist! may say that is very obvious, but how many times have you had the conversation with someone who said “if only we’d known you were here …”? I encountered that many, many times myself. , as a Real Estate Negotiator, are you visible to your target audience if they choose to go looking for property? Like they say, no website is better than a bad website. pdate your Facebook page regularly. Make sure you look credible when your potential clients look at your public presence (website, Facebook). to make them feel like getting in touch with you. Have great testimonials on your website and Facebook page. Nothing is more compelling than having others saying nice things about you. Seek testimonials from past clients. Word of mouth is important here. One easy way to do it is write your testimony for them and ask them to put their name to it. Trust me, your past clients would be happy to oblige for all the good services you have rendered to them before. Look, it doesn't matter how skilfull or wonderful your service is, if no one knows about you, they are not going to buy or sell their properties through you. Therefore, Step 3 is to make sure that your target audiences always think of you when they have a requirement. ​You may want to ask me "
It’s fine to have more than one target audience. Next identify the people in these audiences that are likely to make an enquiry. with the ones that are interested. You must send out all your emails every month. Bear in mind that your potential clients will only take action when they have a requirement, so you need to ensure that you are always in the front of their mind. Therefore you need to keep your emails short, light and chatty. Make sure you do not offend those who don’t have a requirement right now. If I know my prospect's name, I will use their name in my communication with them – which is to make my emails as specific and personal as possible. The more personal and relevant you make your communications, the more interest you will generate. Remember this important point - it is about them and not you. week to make the calls and take the actions. I do just that. So, my advise for you is Just Do it!